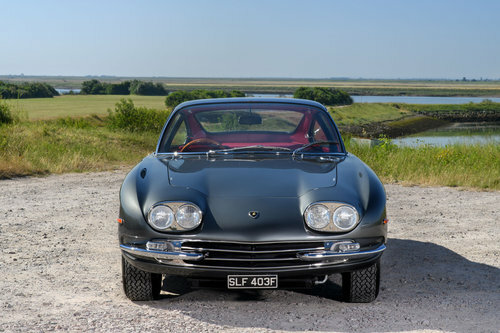 This exceptional Lamborghini is a very rare car being one of only 247 Lamborghini 400 GTs produced and one of only four converted to RHD when new by the UK Lamborghini importer. 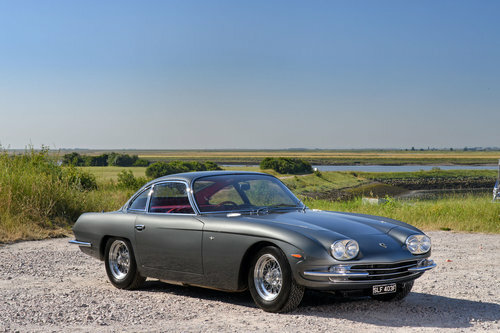 The Lamborghini 400 GT 2+2 was introduced at the 1966 Geneva Auto Show and was designed to replace the earlier 2 seater Lamborghini 350 GT and 400 GT Interim. The principal changes were to the body, especially the roofline, which enabled the installation of the +2 seating in the slightly enlarged cabin, and some mechanical improvements including a new full synchromesh gearbox. 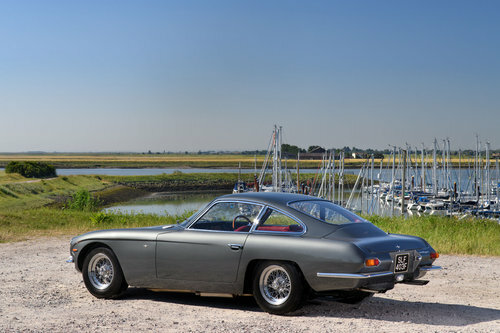 Like its predecessors, the 400 GT 2+2 was of critical importance to Lamborghini in providing the lucrative sports and grand touring car market with a credible alternative to Ferrari. While all 400 GT 2+2s are rare cars, this example is exceptional being one of only four with RHD steering. Manufactured in 1967 it was not registered until January 1968 when it was an executive car with The Star Group of Companies, the UK’s biggest family-owned entertainments company who were eventually acquired by EMI. 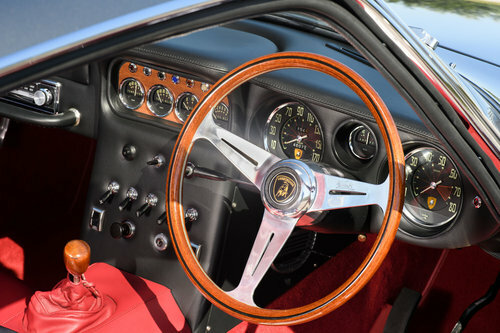 In 1972 the Lamborghini moved to its second owner, a Mr Anthony Thorn of Guildford and remained with him for two years before entering the possession of Mr Kenneth Collins who was to cherish his Lamborghini for over 30 years. 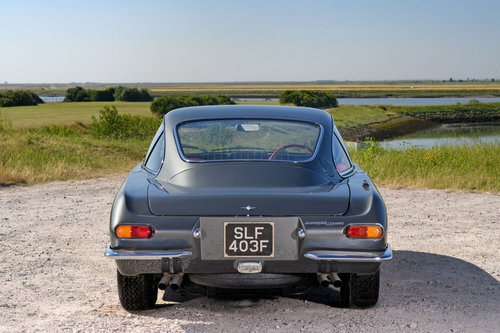 During his lengthy ownership the car was used only sparingly for the first year or so before being carefully maintained in dry storage, which accounts for the modest mileage and excellent degree of originality of the car today. 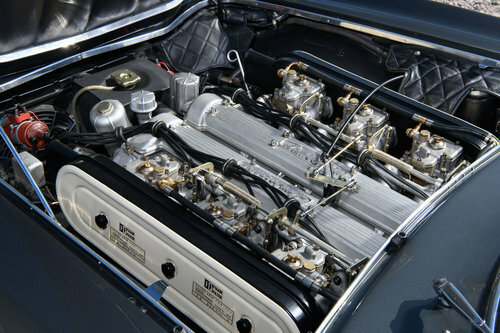 When the car was acquired by its fourth owner it was decided that a car of such rarity warranted a full professional rebuild and in 2008 he commissioned a multi-year program of work which involved a complete disassembly and restoration of the car including bare metal repaint, full engine and mechanical rebuild and total re-trim, all to full concours standards. The work was undertaken by noted UK specialists and extensive invoices are on file with Bill McGrath, XK Engineering, Bob Houghton and final testing and detailing by JD Classics. Upon completion of the restoration in 2013 the car was displayed at the Salon Prive of that year and still presents today in beautiful restored condition. Finished in the stunning colour combination of Grigio St Vincent with Red leather interior and accompanied by a full set of numbers that match the factory build sheet, an extensive history file (including period photographs, original old style log book, invoices, MOTs and a detailed photographic record of the restoration) it offers a fantastic opportunity to acquire one of these iconic and very rare early Lamborghini’s with an outstanding provenance. Lamborghini Diablo Se 30 in wonderfull condition.Full service history.